Venezuelan President Nicolas Maduro won a diplomatic victory by defeating a U.S.-backed proposal at the 34-country Organization of American States that would have suggested an outside mediation to end that country's political crisis, which has already left more than 25 dead and hundreds of wounded. But Maduro's victory could be short-lived. That's the impression I got after interviewing OAS Secretary General Jose Miguel Insulza after Friday's vote in which the regional group approved a resolution supporting the "national dialogue" conducted by the Maduro government in Venezuela, rather than a dialogue moderated by a third party respected by all sides. The OAS resolution passed by 29 to 3 votes, with the United States, Canada and Panama voting against it. The Venezuelan opposition had demanded a third party mediation, arguing that Maduro - who was proclaimed president in a dubious election, has arrested peaceful opposition leaders and is silencing the media - cannot be trusted to preside over the negotiations. Judging from what Insulza told me, the proposal to call on Venezuela to accept an independent mediation may soon be revamped, however, because Venezuela's crisis is not likely to subside. Both the government and the opposition will need to talk to one another in order to prevent an even bigger and bloodier crisis. Venezuela already has a 56 percent inflation rate - the world's highest - and growing food shortages, as well as unprecedented murder rates, which also rank among the world's highest. "I don't think that the tension will decrease as long as the economic and social problems that exist in the country continue," Insulza told me. "For tensions to diminish, both sides must sit down and talk... The economic problems that Venezuela is going through can't be solved just by the government, they must be solved with the help of the business sector, of political parties, etc. And the same goes for the social problems, like the crime-related problems." But what about the Venezuelan opposition's argument that the Maduro government's call for a "national dialogue" is just a gimmick to win time and weaken the street protests? I asked him. "That's not going to happen," Insulza responded. "Tensions will not decrease as long as there is no real will to talk and solve the problems with the help of all sides. Therefore, what has happened in recent days is only one step in the process. As long as there are no long-term solutions to the Venezuelan crisis, tensions will surely continue." Does that mean that the OAS may reopen the debate about a third-part mediation? I asked. Insulza responded that if the Maduro-sponsored "national dialogue" doesn't go anywhere and the crisis continues deepening, "the issue will surely be discussed once again." Asked about the opposition's criticism that he should have used his powers to send an observation mission to Venezuela, Insulza said that under OAS rules such missions can only be ordered by the OAS Permanent Council when there has been "a serious rupture of democratic rule" in the country, "and we are far from that" in Venezuela. My opinion: Hmmm. I wouldn't be so sure that there hasn't been a serious rupture of democratic rule in Venezuela. 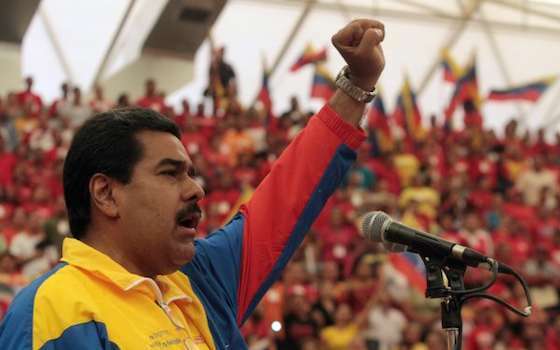 Maduro was declared president by a 1.5 percent margin by a government-controlled electoral tribunal, after a highly questionable electoral process. In addition, it's hard to consider the Maduro government democratic, when it does not respect the separation of powers, arrests peaceful opposition leaders, and silences the media. Even if Maduro had been elected democratically, he's not behaving democratically. But Insulza has a point in that the game may not be over after Maduro's diplomatic victory at the OAS. If Venezuela continues its current slide into hyper-inflation, growing food shortages and massive street crime - as is happening - Maduro himself may need an outside mediator to survive as president. Venezuela will not get out of its escalating crisis unless Maduro begins to understand that he doesn't own a country in which half the population voted against him, and until he accepts a dialogue with an independent mediator. That way, Venezuela should seek a deal to free political prisoners, restore the separation of powers, create an independent electoral tribunal, and restore press freedoms, in exchange for an opposition commitment to call off the protests and help Venezuela's crisis. The OAS' shameful vote in support of Maduro may soon be forgotten, as it becomes increasingly clear that the Venezuelan crisis worsens, and that the Maduro-controled "national dialogue" is a farce. We have only seen the first round of a diplomatic battle that has just begun. "OAS Vote for Venezuela and Maduro May be Short-Lived"